Are ya sick of my running posts? Well, too bad, ‘cuz here comes another one. It was a beautiful day today, the sun was shining, I was wearing my new clothes and I felt like I could go for another run. So, once the baby was down for a nap, I suited up and off I went. I had a route in mind and hoped I could do a solid, non-stop run with no walking intervals. 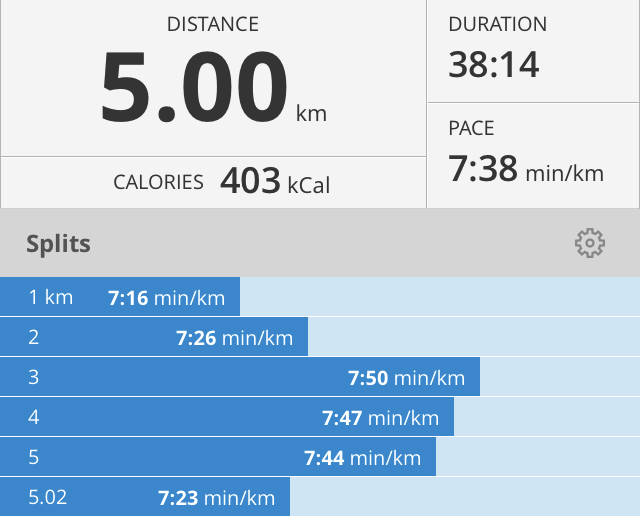 Well, not only did I run non-stop, I also ran 5 km NON-STOP! I did it in just over 38 minutes and I feel amazing. My Achilles tendons ache a bit but I pushed through it. I have never run 5km non-stop. At least I know now that I could run 5km straight in a zombie apocalypse. But after that? I’d probably get eaten.